To create a data source using Google Calendar, go to the Connector Gallery page in Klipfolio and select Google Calendar. Here is a sample query that will help you create a simple API call. Enter the above query in the URL field in Klipfolio. You can use the base query above to retrieve all calendar events, or you can add query parameters to retrieve more specific information with the help of the Google Calendar API Documentation and Google Calendar API explorer. The best way to build your query and add parameters is with the Google Calendar API explorer. Navigate to the Navigate to the Google Calendar API explorer. At Authorize requests using OAuth 2.0 (top right corner of the page) click the ON button. In the popup window, select Authorize. 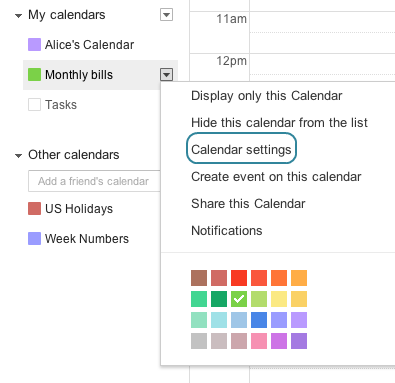 Choose the appropriate Google account for your calendar. Add any additional fields to the query string. Copy the Request URL into Klipfolio. Make sure the date format is using timeMin and timeMax and that they are offset from UTC. In the example above, we build off the base URL above and add date, time and week parameters. In the drop down menu of your chosen calendar, select Calendar settings. At Calendar Address, copy the calendar ID. At Calendar Time Zone copy the time zone in the same format. For example, -04:00.